As the forward look styling cycle was ending, Chrysler President, Lynn Townsend sought a new logo usable by all of Chrysler's worldwide divisions and subsidiaries automotive and non-automotive, on packaging, stationery, and signage and advertising. He wanted something that would be immediately identifiable as Chrysler's mark to anyone who saw it, in any culture. 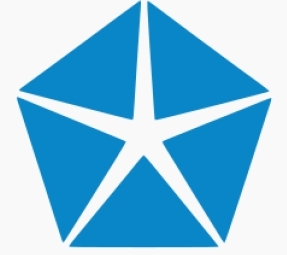 In September 1962, the company adopted a logo named Pentastar, made of five triangles arranged so their bases formed the sides of a pentagon. The gaps in between the triangles formed a star in the middle of the pentagon. The Pentastar was simple and easily recognizable, even on revolving signs, and was not tied to any particular automotive styling feature as had been the previous Forward Look logo. Because the symbol contained no text, it facilitated Chrysler's expansion in international markets. The Pentastar was extensively used on dealer signage, advertisements, and promotional brochures, as well as on Chrysler products themselves. Chrysler-Plymouth literature, advertisements, and dealership signage used a blue Pentastar or a white one on a blue background, while Dodge used a red Pentastar or a white one on a red background. Divisional logos such as Dodge's Fratzog were gradually phased out until, by 1981, all Chrysler divisions used only the Pentastar. All vehicle brands and all the other Chrysler divisions and services—air conditioning systems, heating industrial engines, marine engines, outboard motors, boats, transmissions, four-wheel drive systems, powdered metal products, adhesives, chemical products, plastics, electronics tanks, missiles, leasing, finance and auto parts—were identified by the Pentastar. side fender so it could be viewed by passers-by, a subtle method of getting the symbol ingrained in the public's mind: a nameplate has to be read, but a symbol is quickly recognizable without reading. Thus left-hand drive cars had the Pentastar on the right fender, while right-hand drive cars had it on the left. Starting in the 1980's, hood ornaments on Chrysler-brand vehicles used a gem-like version of the Pentastar to signify the brand's upscale status. The Pentastar's final badging appearance was on special editions of the 1996-2000 Plymouth Voyager. It was also applied to the steering wheel, keys, and fenders of the Voyager and the other Chrysler NS minivans. The Pentastar continued to represent Chrysler until the merge with Daimler in 1998, when it was retired. Among the few remaining traces of this motif was a large, star-shaped window at Daimler Chrysler's American headquarters in Auburn Hills, Michigan, and Pentastar Aviation, a former Daimler Chrysler subsidiary which reverted to its original name after being purchased by a member of the Ford family. Many dealerships still have signage and other traces still visually apparent to the Pentastar, where a five-Pentastar logo remains in use as the logo of the "Five Star Dealer" service rank.